I make bread. Up until recently I’d been making it about once a week. The kneading is fun. It’s work, too. It makes me sweat. And I can do it to music, like cleaning. Except, I run out of cleaning. It’s so cool how the dough rises. You kneed it and kneed it and you have this little ball, and then you tuck it up like a child and (instead of getting up and demanding to be taken to the bathroom) it just grows. And then it’s bigger! Which is cool. And it feels and silky and soft. Like the most excellent blanket. Except if you tried to use it as a blanket it would get sticky all over you. It used to feel prayerful. There was a time when I made bread nearly every day. And I would be up, in the pale light of the early morning, and making bread before anyone else got up. And there was a time when I felt like it helped. Because I made bread every day and it got eaten every day. And that felt… good. Because it feels good to be appreciated. And it feels good to have worked hard on something that turned out right. When did it stop working and why? 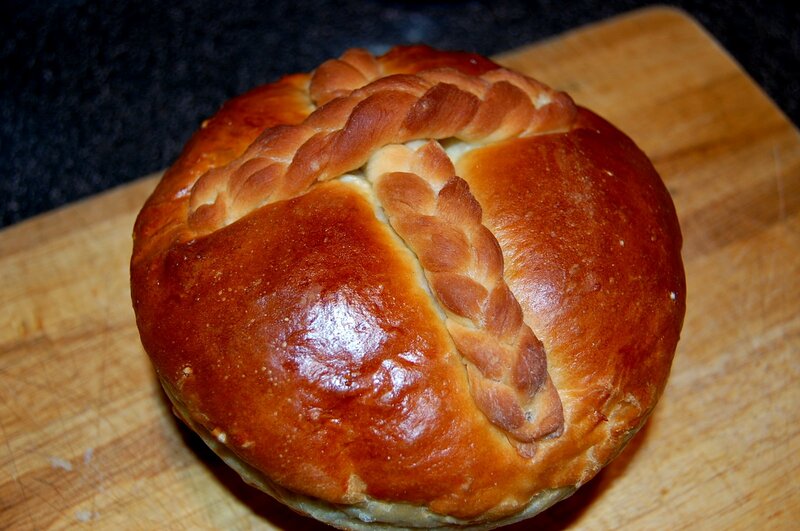 only without the super cool cross of braided bread and with the turtle bread pattern on top instead kinda. 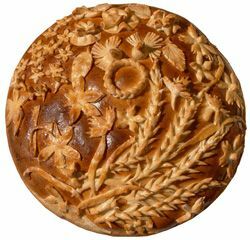 I mean, it’s like an entire freaking Easter mural on a bread. There are feathers on the wings of the twin doves, center, and different feathers on the wings of the seraphim in the top right. The tiny laurel is braided. So much texture, so much detail, so much awesome. Also, yeah, did it look like a turtle with a little head and feet? I don’t remember making that, but I have a recipe for it. The shiny crust is usually one egg breads. You brush the top with an egg before you put it in the oven to get the shine. As to when my bread stopped working: I have no idea.